Are you EYEING easy popularity for your eye specialty hospital? Then go no further, because you can seek this customized 3.875 x 7.25 in one team Boston Team hockey schedule bump shape eye specialty hospital magnets 20 MIL for achieving your aim. People would be happier while accepting this magnet because it easily brings them information about their favored sports team and shows them the route to your clinic, when they are facing sight issues or other eye problems. Doesn’t all this sound exciting! 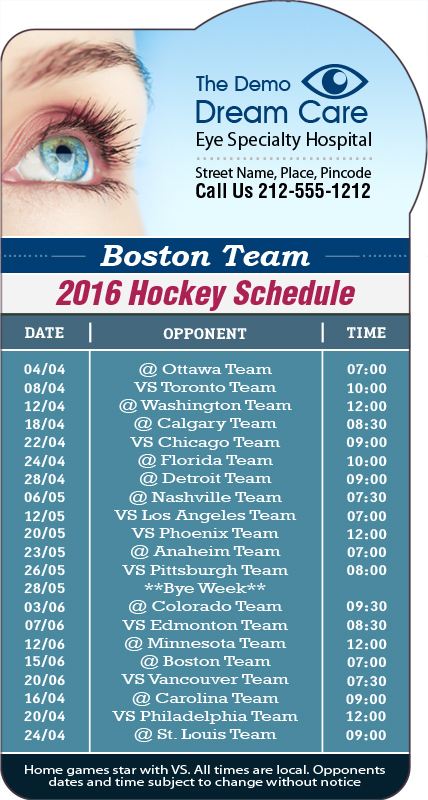 Request a quote to know attractive value benefits that you can avail on wholesale custom 3.875 x 7.25 inch one team Boston Team hockey schedule bump shape eye specialty hospital magnets 20 MIL.